Northrop Grumman has powered up two main components of NASA‘s James Webb Space Telescope as part of the program’s test and integration phase. 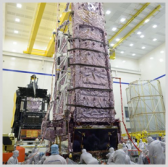 The company said Wednesday it switched on the Optical Telescope element/Integrated Science instrument module and Spacecraft Element separately at facilities located in Redondo Beach, Calif. Engineers used external power tools to generate compatible energy that would start up the spacecraft and support simulation of in-orbit conditions. Once deployed in space, the telescope will employ solar arrays to manage bus subsystems and the Science Instrument Payload, Northrop noted. JWST, a collaborative effort of NASA and its European and Canadian counterparts, is designed to help researchers explore the solar system and uncover the unknown factors of the universe’ origin.